Inder Loves Folk Art: Fence and postage stamp lawn. 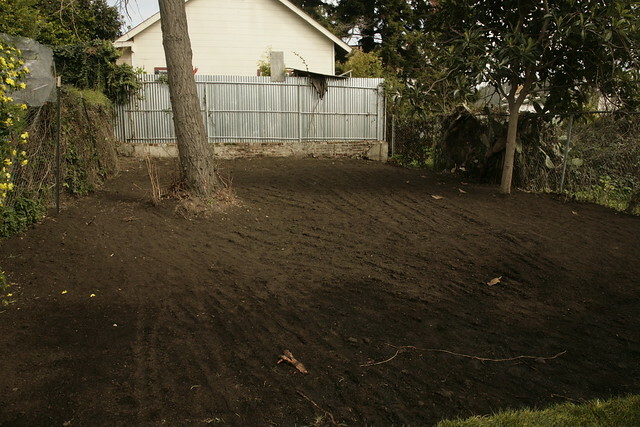 We worked incredibly hard this weekend, trying to create some order in the chaos that is currently our back yard. It has been one of those weekends that leaves you begging to go back to work as soon as possible. Steve "built" a new side fence. It's exactly like our old fence, only newer. We were able to find pre-made fence panels at Home Depot that exactly matched our old ones, and just needed to be fitted into the same holes in the ground. One day, we'd like a more sturdy, more interesting fence, maybe a few feet father back, but this will keep the dogs and Joe from wandering from the back into the front yard, thus making our lives five million percent easier. A cheap, quick fix. We even kept the gate from the old fence, as you may perceive from the difference in patina. Meh. We believe in doing as little as possible reusing whenever possible. 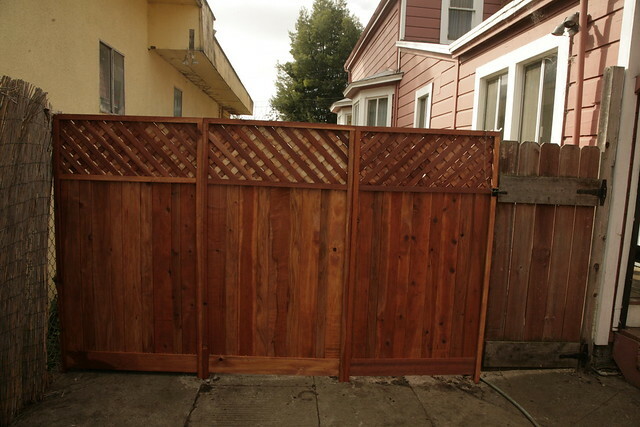 We did seal the fence with something reddish in color, just to make the gate look older and crummier. 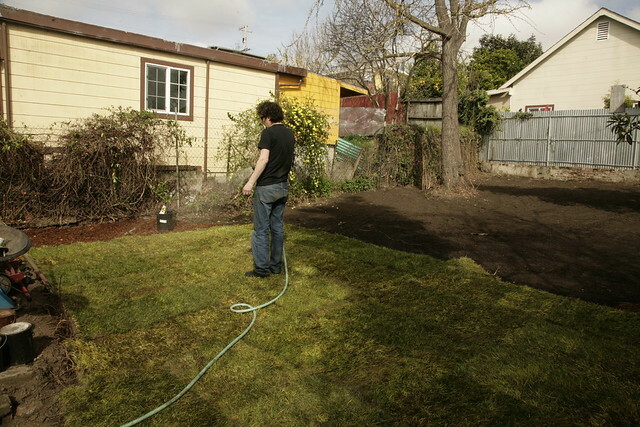 We also put down a little bit of sod in the front part of the yard (where our lawn was before - I guess we're pretty predictable). We are not big lawn people (we have no lawn at all in the front yard), but a little bit is nice for the dogs and kiddo. This, plus some mulch, will hopefully reduce the amount of mud coming back into our house on feet and paws. The sun finally came out this weekend, so we can see that the middle of the back yard gets lots of light (yay!). Right now, our plan is to put beds of flowers, herbs, and some shrubs around the lawn, with a raised bed vegetable garden behind it. While I have never been one to tout raised beds as the answer to all vegetable gardening issues (raised beds require more water than regular in-the-ground planting), I am seeing the benefits of raised beds when you have dogs and children around. We'd like to do a little play area to the right, which is the shadier (North-facing) side of the garden. In the very back, I am dreaming of a raised bed beneath that wall with berries and fruit and who knows what else. This still leaves us with a lot of space to fill. It's a bit overwhelming, really. Luckily (? ), we have a great little helper. 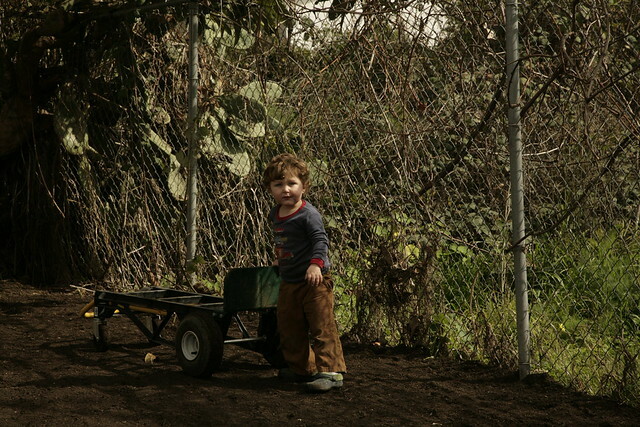 To tire out your toddler, encourage him to push this cart around the yard repeatedly. You've got room for chickens if you want. Raised beds can be built so many ways---depending on the look you want-- that can be really inexpensive and less labor intensive than trying to loosen up your soil. I think it is so exciting, it is going to end up so beautiful. Keeping dreaming and sharing, can't wait to see how it evolves. We had a yard with a huge dead tree, a half dead lawn, and a huge pebbled dog run. In five years with very little money and lots of sweat, it is actually pretty cool. Put that chapter behind *us. * I'm not capable of commenting on a blog without at least one typo, it seems.